Why in the world would I object to this? This is about how grown ups forget that they were young, and forget the genuinely terrible things they did in their youth. I was the kid who got called fag, and I was the kid who got called lame. I got bullied all the time. And I got bullied all the time by Marie’s boyfriend. She used him to belittle and intimidate me. Now that Marie has a skinny teenage kid of her own, she’s “against” bullying. But when it served her, she used it often. Thank you, Marie, for being a shallow, self-serving amnesiac douchebag. 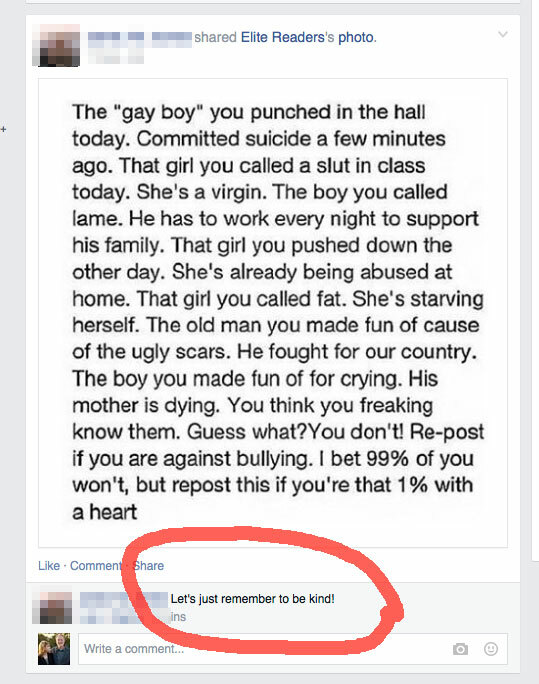 On behalf of all who have been bullied, I say your reaction is justified. Further, does one really need a reason (“his mother is dying”) to not make fun of a boy for crying? I certainly don’t need a reason not to “push down” a girl; it shouldn’t matter whether she’s being abused at home when it comes to my decision whether to be mean or kind to her. We can be better than this. We don’t need such outlandish reasons to be kind to people. Should I be kind to someone I meet tomorrow because I think she might have a horrible situation at home, or should I just be kind to her?